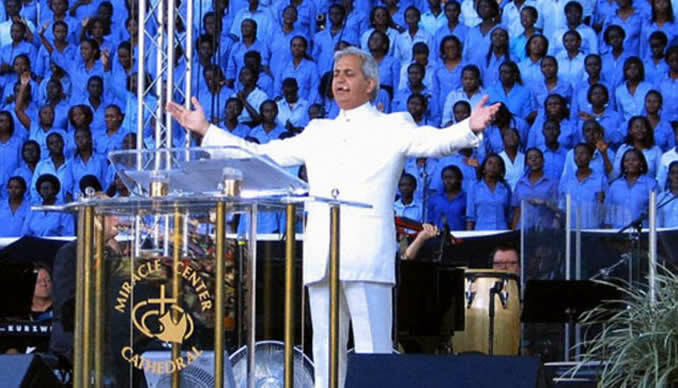 ZIMBABWE'S economy will grow in a manner that will shock the world, renowned televangelist Pastor Benny Hinn has said. At a recent prayer meeting in the United States which was attended by local clergyman Prophet Passion Java, Pr Hinn said God showed him that the economy would be revived. He said, "Zimbabwe's economy and its people will rise. I also love the anointing on Prophet Java because he is a man of God who is dedicated to serving the Lord. Zimbabwe is blessed to have prayerful people including Prophet Passion. He loves his country and talks a lot of good about it." Born Toufik Benedictus Hinn on December 3, 1952, Pastor Hinn is an Israeli televangelist who ministers faith healing and has written several Christian books. Prophet Java told the congregation that Zimbabweans endured economic challenges for several years but things were changing for the better. "Every Zimbabwean should stay in faith because God did not bring us this far to leave us," he said. "When you can give God praise even when life or economy does not make sense, he will release you into a new level. God can take your darkest hour and turn it into your brightest hour. As a nation we have to keep working hard, continue to get better educational and professional qualifications and believe in God." Prophet Java paid tribute to Pr Hinn, whom he described as a great inspiration. "Pr Hinn inspires me ever since I was a child; I have followed his ministry for many years. In our meeting with Pastor Hinn, we prayed for our beautiful country Zimbabwe and God will revive our economy, He is faithful. "God may have taken you a different route than you thought, but He knows how to get you to the correct destination. God uses the difficult times to get us prepared for the next level." Passion Java came to prominence five years ago after performing controversial miracles before he moved to the US to join his "spiritual father", Bishop Noel Jones.